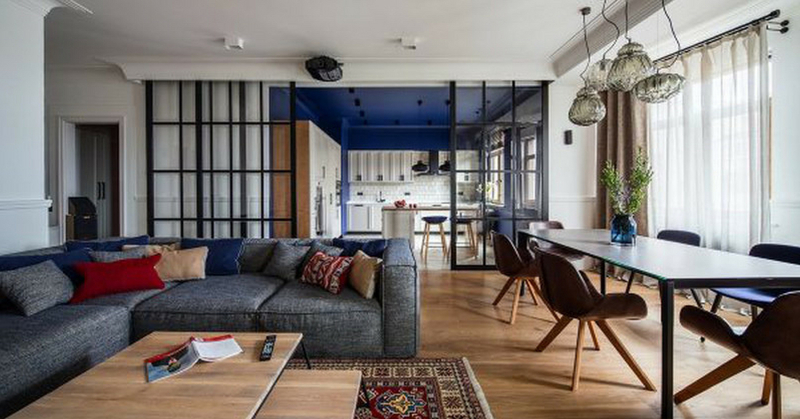 A designer based in Kiev, Ukraine took up the challenge to construct two distinctive styles into one space. Usually, combining two concepts that happen to be the complete opposite of each other would be arduous, despite keeping tabs on the ever-changing trends. But, the designer surprised the owners with successfully blending two diverse styles and has now become the leading interior designer in Ukrainian circles. As we can see, millennials seemingly prefer a simplistic and functional approach to their homes with a mix of tradition as the basis of design. Dolgopiatova uses white walls and a variety of integrated colors to harmonize the living quarters in communicating a smooth flow. Some rugs, pillows, light pieces, and curtains add culture to the whole ambiance. Ukrainian furniture and décor fill the room and inspire awe and invigoration of the unrestricted surrounds, inspiring an intelligent look. Observed further into the apartment are some very exciting and practical uses of the interiors with splashes of bright colors, simplistic lines, and the use of hearty wood elements.